"Green Berets" redirects here. For other uses, see Green Berets (disambiguation). "United States Special Forces" redirects here. It is not to be confused with United States special operations forces. 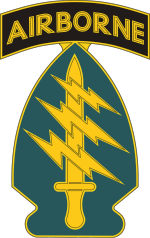 The United States Army Special Forces, colloquially known as the Green Berets due to their distinctive service headgear, are a special operations force of the United States Army tasked with five primary missions: unconventional warfare (the original and most important mission of Special Forces), foreign internal defense, special reconnaissance, direct action, and counter-terrorism. The first two emphasize language, cultural, and training skills in working with foreign troops. Other duties include combat search and rescue (CSAR), counter-narcotics, counter-proliferation, hostage rescue, humanitarian assistance, humanitarian demining, information operations, peacekeeping, psychological operations, security assistance, and manhunts; other components of the United States Special Operations Command (USSOCOM) or other U.S. government activities may also specialize in these secondary areas. Many of their operational techniques are classified, but some nonfiction works and doctrinal manuals are available. As special operations units, Special Forces are not necessarily under the command authority of the ground commanders in those countries. Instead, while in theater, SF units may report directly to a geographic combatant command, USSOCOM, or other command authorities. The Central Intelligence Agency's (CIA) highly secretive Special Activities Division (SAD) and more specifically its Special Operations Group (SOG) recruits from the Army's Special Forces. Joint CIA–Army Special Forces operations go back to the MACV-SOG branch during the Vietnam War. The cooperation still exists today and is seen in the War in Afghanistan. 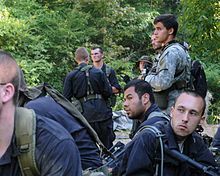 8 Use of the term "Special Forces"
9 Use of the term "Operator"
The primary mission of the Army Special Forces is to train and lead unconventional warfare (UW) forces, or a clandestine guerrilla force in an occupied nation. The 10th Special Forces Group was the first deployed SF unit, intended to train and lead UW forces behind enemy lines in the event of a Warsaw Pact invasion of Western Europe. As the U.S. became involved in Southeast Asia, it was realized that specialists trained to lead guerrillas could also help defend against hostile guerrillas, so SF acquired the additional mission of Foreign Internal Defense (FID), working with Host Nation (HN) forces in a spectrum of counter-guerrilla activities from indirect support to combat command. Special Forces personnel qualify both in advanced military skills and the regional languages and cultures of defined parts of the world. While they are best known for their unconventional warfare capabilities, they also undertake other missions that include direct action raids, peace operations, counter-proliferation, counter-drug advisory roles, and other strategic missions. As strategic resources, they report either to USSOCOM or to a regional Unified Combatant Command. [clarification needed] To enhance their DA capability, specific Commanders In-Extremis Force (CIF) teams were created with a focus on the direct action side of special operations. SF team members work closely together and rely on one another under isolated circumstances for long periods of time, both during extended deployments and in garrison. Because of this, they develop clannish relationships and long-standing personal ties. SF non-commissioned officers (NCO) often spend their entire careers in Special Forces, rotating among assignments to detachments, higher staff billets, liaison positions, and instructor duties at the U.S. Army John F. Kennedy Special Warfare Center and School (USAJFKSWCS). They are then required to move to staff positions or to higher command echelons. With the creation of USSOCOM, SF commanders have risen to the highest ranks of U.S. Army command, including command of USSOCOM, the Army's Chief of Staff, and the Chairman of the Joint Chiefs of Staff. Special Forces traces its roots as the Army’s premier proponent of unconventional warfare from purpose-formed special operations units like the Alamo Scouts, Philippine guerrillas, First Special Service Force, and the Operational Groups (OGs) of the Office of Strategic Services. Although the OSS was not an Army organization, many Army personnel were assigned to the OSS and later used their experiences to influence the forming of Special Forces. During the Korean War, individuals such as former Philippine guerrilla commanders Col. Wendell Fertig and Lt. Col. Russell W. Volckmann used their wartime experience to formulate the doctrine of unconventional warfare that became the cornerstone of the Special Forces. In 1951, Major General Robert A. McClure chose former OSS member Colonel Aaron Bank as Operations Branch Chief of the Special Operations Division of the Psychological Warfare Staff (OCPW) in the Pentagon. In June 1952, the 10th Special Forces Group (Airborne) was formed under Col. Aaron Bank, soon after the establishment of the Psychological Warfare School, which ultimately became today’s John F. Kennedy Special Warfare Center and School. The 10th Special Forces Group (Airborne) was split, with the cadre that kept the designation 10th SFG deployed to Bad Tölz, Germany, in September 1953. 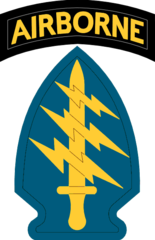 The remaining cadre at Fort Bragg formed the 77th Special Forces Group, which in May 1960 was reorganized and designated as today’s 7th Special Forces Group. Since their establishment in 1952, Special Forces soldiers have operated in Vietnam, Cambodia, Laos, North Vietnam, Guatemala, Nicaragua, El Salvador, Colombia, Panama, Haiti, Somalia, Bosnia, Kosovo, 1st Gulf War, Afghanistan, Iraq, the Philippines, Syria, Yemen, Niger and, in an FID role, East Africa. Soldiers from each of the Army's seven Special Forces groups (note seven different colors of beret patches) at the gravesite of President John F. Kennedy in November 2011. In 1957 the two original special forces groups (10th and 77th) were joined by the 1st, stationed in the Far East. Additional groups were formed in 1961 and 1962 after President John F. Kennedy visited the Special Forces at Fort Bragg in 1961. Nine groups were organized for the reserve components in 1961. (Tsouras, 1994, 91). Among them were the 16th and 17th Special Forces, Groups. However, 17th Special Forces Group, a National Guard formation with elements in Washington, was disestablished on 31 January 1966. In the early twenty-first century, Special Forces are divided into five active duty (AD) and two Army National Guard (ARNG) Special Forces groups. Each Special Forces Group (SFG) has a specific regional focus. The Special Forces soldiers assigned to these groups receive intensive language and cultural training for countries within their regional area of responsibility (AOR). Due to the increased need for Special Forces soldiers in the War on Terror, all Groups—including those of the National Guard (19th and 20th SFGs)—have been deployed outside of their areas of operation (AOs), particularly to Iraq and Afghanistan. A recently released report showed Special Forces as perhaps the most deployed SOF under USSOCOM, with many soldiers, regardless of Group, serving up to 75% of their careers overseas, almost all of which had been to Iraq and Afghanistan. Until recently an SF group has consisted of three battalions, but since the Department of Defense has authorized the 1st Special Forces Command to increase its authorized strength by one third, a fourth battalion was activated in each active component group by 2012. A Special Forces group is historically assigned to a Unified Combatant Command or a theater of operations. The Special Forces Operational Detachment C or C-detachment (SFODC) is responsible for a theater or a major subcomponent, which can provide command and control of up to 18 SFODAs, three SFODB, or a mixture of the two. Subordinate to it is the Special Forces Operational Detachment Bs or B-detachments (SFODB), which can provide command and control for six SFODAs. Further subordinate, the SFODAs typically raise company- to battalion-sized units when on unconventional warfare missions. They can form 6-man "split A" detachments that are often used for special reconnaissance. 1st Special Forces Group – Headquartered at Joint Base Lewis–McChord, Washington along with its 2nd, 3rd, and 4th Battalions, its 1st Battalion is forward deployed at Torii Station, Okinawa. The 1SFGA is oriented towards the Pacific region, and is often tasked by PACOM. Currently, 1SFGA and two of its battalions spend roughly six months out of every twelve deployed on a rotational basis to either Iraq as Combined Joint Special Operations Task Force – Arabian Peninsula, to Afghanistan as Combined Joint Special Operations Task Force – Afghanistan, or to the Philippines as Joint Special Operations Task Force – Philippines. 3rd Special Forces Group – Headquartered at Fort Bragg, North Carolina. The 3SFGA is theoretically oriented towards all of Sub-Saharan Africa with the exception of the Eastern Horn of Africa, i.e. AFRICOM. In practice, 3SFGA and two of its battalions spend roughly six months out of every twelve deployed to Afghanistan as Combined Joint Special Operations Task Force – Afghanistan. 5th Special Forces Group – Headquartered at Fort Campbell, Kentucky. The 5SFGA is oriented towards the Middle East, Persian Gulf, Central Asia and the Horn of Africa (HOA), and is frequently tasked by CENTCOM. Currently, 5SFGA and two of its battalions spend roughly six months out of every twelve deployed to Iraq as Combined Joint Special Operations Task Force – Arabian Peninsula. 7th Special Forces Group – Headquartered at Eglin Air Force Base, Florida. The 7SFG(A) is oriented towards the western hemisphere: South America, Central America, and the Caribbean (i.e. the USSOUTHCOM AOR). Although not aligned, the 7SFG(A) has also supported USNORTHCOM activities in its AOR. In practice, 7SFG(A) and two of its battalions spend roughly six months out of every twelve deployed to Afghanistan as Combined Joint Special Operations Task Force – Afghanistan. In 2011, 7SFG(A) relocated from Fort Bragg, North Carolina to Eglin Air Force Base, Florida as part of the 2005 Base Realignment and Closure (BRAC) round. 10th Special Forces Group – Headquartered at Fort Carson, Colorado along with its 2nd, 3rd and newly added 4th Battalions, its 1st Battalion is forward deployed in the Panzer Kaserne (Panzer Barracks) in Böblingen near Stuttgart, Germany. The 10SFGA is theoretically oriented towards Europe, mainly Central and Eastern Europe, the Balkans, Turkey, Israel, Lebanon and Northern Africa, i.e. EUCOM. In practice, 10SFGA and two of its battalions spend roughly six months out of every twelve deployed to Iraq as Combined Joint Special Operations Task Force – Arabian Peninsula. 19th Special Forces Group – One of two National Guard Special Forces Groups. Headquartered in Draper, Utah, with companies in Washington, West Virginia, Ohio, Rhode Island, Colorado, California, and Texas, the 19SFGA is oriented towards Southwest Asia (shared with 5SFGA), Europe (shared with 10SFGA), as well as Southeast Asia (shared with 1SFGA). 20th Special Forces Group – One of two National Guard Special Forces Groups. Headquartered in Birmingham, Alabama, with battalions in Alabama (1st Battalion), Mississippi (2nd Battalion), and Florida (3rd Battalion), with assigned Companies and Detachments in North Carolina ; Chicago; Louisville, Kentucky; Western Massachusetts; and Baltimore. The 20SFGA has an area of responsibility (AOR) covering 32 countries, including Latin America south of Mexico, the waters, territories, and nations in the Caribbean sea, the Gulf of Mexico, and the southwestern Atlantic Ocean. Orientation towards the region is shared with 7SFGA. 6th Special Forces Group – Active from 1963 to 1971. Based at Ft. Bragg, North Carolina. Assigned to Southwest Asia (Iraq, Iran, etc.) and Southeast Asia. Many of the 103 original Son tay raider volunteers were from 6SFGA. 8th Special Forces Group – Active from 1963 to 1972. Responsible for training armies of Latin America in counter-insurgency tactics. 11th Special Forces Group (U.S. Army Reserve) – Active from 1961 to 1994. 12th Special Forces Group (U.S. Army Reserve) – Active from 1961 to 1994. The SFODC, or "C-Team", is the headquarters element of a Special Forces battalion. As such, it is a command and control unit with operations, training, signals and logistic support responsibilities to its three subordinate line companies. A lieutenant colonel commands the battalion as well as the C-Team, and the Battalion Command Sergeant Major is the senior NCO of the battalion and the C-Team. There is an additional 20–30 SF personnel who fill key positions in operations, logistics, intelligence, communications and medical. A Special Forces battalion usually consists of four companies: "A", "B", "C", and Headquarters/Support. A Special Forces company commander meets with village elders and members of the 209th ANA Corps in Helmand Province, Afghanistan, 2007. The ODB, or "B-Team", is the headquarters element of a Special Forces company, and it is usually composed of 11–13 soldiers. While the A-team typically conducts direct operations, the purpose of the B-Team is to support the company's A-Teams both in garrison and in the field. When deployed, in line with their support role, B-Teams are usually found in more secure rear areas. However, under some circumstances a B-Team will deploy into a hostile area, usually to coordinate the activities of multiple A-Teams. The ODB is led by an 18A, usually a major, who is the company commander (CO). The CO is assisted by his company executive officer (XO), another 18A, usually a captain. The XO is himself assisted by a company technician, a 180A, generally a chief warrant officer three, who assists in the direction of the organization, training, intelligence, counter-intelligence, and operations for the company and its detachments. The company commander is assisted by the company sergeant major, an 18Z, usually a Sergeant Major. A second 18Z acts as the operations sergeant, usually a Master Sergeant, who assists the XO and technician in their operational duties. He has an 18F assistant operations sergeant, who is usually a Sergeant First Class. The company's support comes from an 18D medical sergeant, usually a Sergeant First Class, and two 18E communications sergeants, usually a Sergeant First Class and a Staff Sergeant. The supply NCO, usually a Staff Sergeant, the commander's principal logistical planner, works with the battalion S-4 to supply the company. 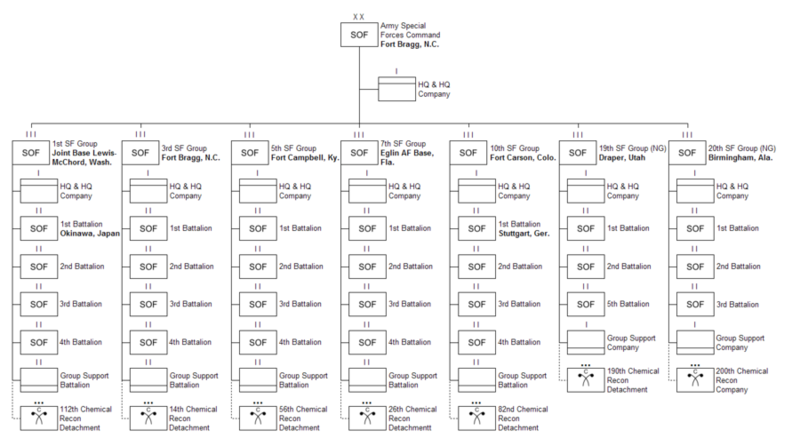 The Chemical, Biological, Radiological, Nuclear (CBRN defense) NCO, usually a Sergeant, maintains and operates the company's NBC detection and decontamination equipment, and assists in administering NBC defensive measures. Other jobs can also exist depending on the B-Team structure. Specialist team members can include I.T. (S-6) personnel, and Military Intelligence Soldiers, including Intelligence Analysts (35F), Human Intelligence Collectors (35M), Signals Intelligence (35 N/P - also known as SOT-A and SOT-B as related to their positions on SFODA and SFODB teams), Intelligence Officers (35 D/E/F), and Counterintelligence Special Agents (35L/351L). A Special Forces company normally consists of six ODAs (Operational Detachments-A) or "A-Teams". Each ODA specializes in an infiltration skill or a particular mission-set (e.g. Military Freefall (HALO), combat diving, mountain warfare, maritime operations, etc.). An ODA is identified by its group, battalion, company, and the team itself. For example, ODA 1234 would be the fourth team in the third company of the second battalion of 1st Special Forces Group. An ODA consists of 12 men, each of whom has a specific function (MOS or Military Occupational Specialty) on the team, however all members of an ODA conduct cross-training. The ODA is led by an 18A (Detachment Commander), a Captain, and a 180A (Assistant Detachment Commander) who is his second in command, usually a Warrant Officer One or Chief Warrant Officer Two. The team also includes the following enlisted men: one 18Z (Operations Sergeant) (known as the "Team Sergeant"), usually a Master Sergeant, one 18F (Assistant Operations and Intelligence Sergeant), usually a Sergeant First Class, and two each, 18Bs (Weapons Sergeant), 18Cs (Engineer Sergeant), 18Ds (Medical Sergeant), and 18Es (Communications Sergeant), usually Sergeants First Class, Staff Sergeants or Sergeants. This organization facilitates 6-man "split team" operations, redundancy, and mentoring between a senior NCO and his junior assistant. Score a General Technical score of 110 or higher or a combat operation score of 110 on the Armed Services Vocational Aptitude Battery. Must pass the Physical Fitness Assessment with at least 49 push-ups, 59 sit-ups, 6 pull-ups, and run 2 miles in a maximum of 15:12. Must successfully complete the Pre-Basic Task list. Must have 20/20 or corrected to 20/20 in both near and distant vision in both eyes. One year of college is preferred, but it is not mandatory for enlistment. A Special Forces candidate conducts a pre-mission rehearsal with Army ROTC cadets role-playing guerrilla fighters during ROBIN SAGE. The Special Forces soldier trains on a regular basis over the course of his entire career. The initial formal training program for entry into Special Forces is divided into four phases collectively known as the Special Forces Qualification Course or, informally, the "Q Course". The length of the Q Course changes depending on the applicant's primary job field within Special Forces and his assigned foreign language capability, but will usually last between 55 and 95 weeks. After successfully completing the Special Forces Qualification Course, Special Forces soldiers are then eligible for many advanced skills courses. These include, but are not limited to, the Military Free Fall Parachutist Course (MFF), the Combat Diver Qualification Course, and the Special Forces Sniper Course (SFSC). U.S. Army Special Forces adopted the green beret unofficially in 1954 after searching for a piece of headgear that would set them visually apart. Members of the 77th SFG began searching through their accumulated berets and settled on the Rifle Green color from Captain Miguel de la Peña's collection. Captain Frank Dallas had the new beret designed and produced in small numbers for the members of the 10th & 77th Special Forces Groups. Their new headdress was first worn at a retirement parade at Fort Bragg on 12 June 1955 for Lieutenant General Joseph P. Cleland, the now-former commander of the XVIII Airborne Corps. Onlookers thought that the commandos were a foreign delegation from NATO. In 1956 General Paul D. Adams, the post commander at Fort Bragg, banned the wearing of the distinctive headdress, (although members of the Special Forces continued to wear it surreptitiously). This was reversed on 25 September 1961 by Department of the Army Message 578636, which designated the green beret as the exclusive headdress of the Army Special Forces. In 1961, President John F. Kennedy authorized them for use exclusively by the U.S. Special Forces. Preparing for a 12 October visit to the Special Warfare Center at Fort Bragg, North Carolina, the President sent word to the Center's commander, Colonel William P. Yarborough, for all Special Forces soldiers to wear green berets as part of the event. The President felt that since they had a special mission, Special Forces should have something to set them apart from the rest. In 1962, he called the green beret "a symbol of excellence, a badge of courage, a mark of distinction in the fight for freedom". Forrest Lindley, a writer for the newspaper Stars and Stripes who served with Special Forces in Vietnam said of Kennedy's authorization: "It was President Kennedy who was responsible for the rebuilding of the Special Forces and giving us back our Green Beret. People were sneaking around wearing [them] when conventional forces weren't in the area and it was sort of a cat and mouse game. Then Kennedy authorized the Green Beret as a mark of distinction, everybody had to scramble around to find berets that were really green. We were bringing them down from Canada. Some were handmade, with the dye coming out in the rain". Kennedy's actions created a special bond with the Special Forces, with specific traditions carried out since his funeral, when a sergeant in charge of a detail of Special Forces soldiers guarding the grave placed his beret on the coffin. The moment was repeated at a commemoration of the 25th anniversary of JFK's death – General Michael D. Healy (ret. ), the last commander of Special Forces in Vietnam and later a commander of the John F. Kennedy Special Warfare Center and School, spoke at Arlington Cemetery, after which a wreath in the form of a green beret was placed on Kennedy's grave. On a wreath of the colors (Argent and Sable), two arrows saltire-wise Argent – that is, two silver arrows crossed with a dagger, also silver, above them, surrounded by a black ribbon. The regimental crest is taken from the gold crossed arrow collar (branch) beret insignia of the First Special Service Force, an American-Canadian commando unit organized in 1942 for World War II. The crest was changed to silver to create visual harmony with the shield, as well as to make a difference from the collar insignia. This distinctive unit insignia was approved on 8 July 1960. The insignia of the 1st Special Forces was authorized to be worn by enlisted personnel of the U.S. Army Special Forces Command (Airborne) and its subordinate units since at least 1965. The US Army's 1st Special Forces Command (Airborne) shoulder sleeve insignia (SSI) is worn by all those assigned to the command and its subordinate units that have not been authorized their own SSI, such as the Special Forces Groups. According to the U.S. Army Institute of Heraldry, the shape and items depicted in the SSI have special meaning: "The arrowhead alludes to the American Indian's basic skills in which Special Forces personnel are trained to a high degree. The dagger represents the unconventional nature of Special Forces operations, and the three lightning flashes, their ability to strike rapidly by air, water or land." Prior to the establishment of the 1st Special Forces Command SSI, the special forces groups that stood up between 1952 and 1955 wore the Airborne Command SSI. According to the U.S. Army Institute of Heraldry, the Airborne Command SSI was reinstated on 10 April 1952—after being disbanded in 1947—and authorized for wear by certain classified units—such as the newly formed 10th and 77th Special Forces Groups—until the establishment of the 1st Special Forces Command (Airborne) SSI on 22 August 1955. Introduced in June 1983, the Special Forces Tab is a service school qualification tab awarded to soldiers who complete one of the Special Forces Qualification Courses. Unlike the Green Beret, soldiers who are awarded the Special Forces Tab are authorized to wear it for the remainder of their military careers, even when not serving with Special Operations units. The cloth tab is an olive drab arc tab 3 1/4 inches (8.26 cm) in length and 11/16 inch (1.75 cm) in height overall, the designation "SPECIAL FORCES" in black letters 5/16 inch (.79 cm) in height and is worn on the left sleeve of utility uniforms above a unit's Shoulder Sleeve Insignia and below the President's Hundred Tab (if so awarded). The metal Special Forces Tab replica comes in two sizes, full and dress miniature. The full size version measures 5/8 inch (1.59 cm) in height and 1 9/16 inches (3.97 cm) in width. The miniature version measures 1/4 inch (.64 cm) in height and 1 inch (2.54 cm) in width. Both are teal blue with yellow border trim and letters and are worn above or below ribbons or medals on the Army Service Uniform. 1.1)Successful completion of U.S. Army John F. Kennedy Special Warfare Center and School (USAJFKSWCS) approved Active Army (AA) institutional training leading to SF qualification. 1.2) Successful completion of a USAJFKSWCS approved Reserve Component (RC) SF qualification program. 1.3) Successful completion of an authorized unit administered SF qualification program. 2.1) For successful completion of the Special Forces Qualification Course or Special Forces Detachment Officer Qualification Course (previously known as the Special Forces Officer Course). These courses are/were conducted by the USAJFKSWC (previously known as the U.S. Army Institute for Military Assistance). 2.2) Prior to 1 January 1988, for successful completion of the then approved program of instruction for Special Forces qualification in a Special Forces Group, who were subsequently awarded, by competent authority, SQI "S" in Career Management Field 18 (enlisted), or SQI "3" in Functional Area 18 (officer). 3) Reserve Component (RC) SF qualification programs. The SF Tab may be awarded to all personnel who successfully complete an RC SF qualification program according to TRADOC Regulation 135-5, dated 1 June 1988 or its predecessors and who were subsequently awarded, by competent authority, SQI "S" or "3" in MOS 11b, 11C, 12B, 05B, 91B, or ASI "5G" or "3." The USAJFKSWCS will determine individual entitlement for an award of the SF Tab based on historical review of Army, Continental Army Command (CONRAC), and TRADOC regulations prescribing SF qualification requirements in effect at the time the individual began an RC SF qualification program. 4) Unit administered SF qualification programs. The SF Tab may be awarded to all personnel who successfully completed unit administered SF qualification programs as authorized by regulation. The USAJFKSWCS will determine individual entitlement to an award of the SF Tab based upon a historical review of regulations prescribing SF qualification requirements in effect at the time the individual began a unit administered SF qualification program. 5.1) 1942 through 1973. Served with a Special Forces unit during wartime and were either unable to or not required to attend a formal program of instruction but were awarded SQI "S", "3", "5G" by the competent authority. 5.2.1) 1st Special Service Force, August 1942 to December 1944. 5.2.2) OSS Detachment 101, April 1942 to September 1945. 5.2.3) OSS Jedburgh Detachments, May 1944 to May 1945. 5.2.4) OSS Operational Groups, May 1944 to May 1945. 5.2.5) OSS Maritime Unit, April 1942 to September 1945. 5.2.6) 6th Army Special Reconnaissance Unit (Alamo Scouts), February 1944 to September 1945. 5.2.7) 8240th Army Unit, June 1950 to July 1953. 5.2.8a) SF Operational Detachment-A (A-Team). 5.2.8d) SF Special Project Unit. Use of the term "Special Forces"
In countries other than the U.S., the term "special forces" or "special operations forces" (SOF) is often used generically to refer to any units with elite training and special mission sets. In the U.S. military, "Special Forces" is a proper (capitalized) noun referring exclusively to U.S. Army Special Forces (a.k.a. "The Green Berets"). The media and popular culture frequently misapply the term to Navy SEALs and other members of the U.S. Special Operations Forces. Use of the term "Operator"
The origin of the term operator in American special operations comes from the U.S. Army Special Forces (aka the Green Berets). The Army Special Forces was established in 1952, ten years before the Navy SEALs and 25 years before DELTA. Every other modern U.S. special operations unit in the Army, Navy, Air Force and Marines was established after 1977. In Veritas: Journal of Army Special Operations History, Charles H. Briscoe states that the Army "Special Forces did not misappropriate the appellation. Unbeknownst to most members of the Army Special Operations Force (ARSOF) community, that moniker was adopted by the Special Forces in the mid-1950s." 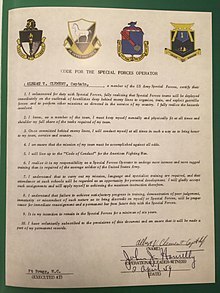 He goes on to state that all qualified enlisted and officers in Special Forces had to "voluntary subscribe to the provisions of the 'Code of the Special Forces Operator' and pledge themselves to its tenets by witnessed signature." This pre-dates every other special operations unit that currently uses the term/title operator. Inside the United States Special Operations community, an operator is a Delta Force member who has completed selection and has graduated OTC (Operators Training Course). 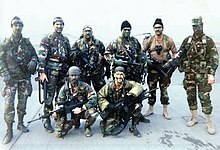 Operator was used by Delta Force to distinguish between operational and non-operational personnel assigned to the unit. Other special operations forces use specific names for their jobs, such as Army Rangers and Air Force Pararescuemen. The Navy uses the acronym SEAL for both their special warfare teams and their individual members, who are also known Special Operators. In 2006 the Navy created "Special Warfare Operator" (SO) as a rating specific to Naval Special Warfare enlisted personnel, grades E-4 to E-9. (See Navy special warfare ratings). Operator is the specific term for operational personnel, and has become a colloquial term for almost all special operations forces in the U.S. military, as well as around the world. 1965: The Green Berets, a book by Robin Moore. 1966: "Ballad of the Green Berets", a song performed by Vietnam veteran and Green Beret Barry Sadler. The song was written by Sadler and Robin Moore. 1968: The Green Berets, a film based on Moore's book, produced, directed, and starring John Wayne, who plays a key role in it as "Colonel Kirby". Tales of the Green Beret, a comic strip and American comic book written by Robin Moore with artwork by Joe Kubert. 1975: Parthian Shot, by former Green Beret Loyd Little. ISBN 978-0670540631, OCLC 1119712; winner of the 1976 Hemingway Foundation/PEN Award. 1982: Rambo, the main character in a series of films, starting with First Blood, who is a former Green Beret and Vietnam vet. 1998: Metal Gear Solid, an action-adventure stealth video game directed by Hideo Kojima, it stars Solid Snake as a fictional former Green Beret. 2008: White Passage: Red Sun, by former Green Beret Matt Rowe. ISBN 978-1-4389-2771-8, 2008, Authorhouse. 2009: Horse Soldiers: The Extraordinary Story of a Band of U.S. Soldiers Who Rode to Victory in Afghanistan, by Doug Stanton; adapted into the 2018 film, 12 Strong. ^ "Inside the Green Berets' Hunt for Wanted Warlord Joseph Kony". NBC News. 6 March 2017. ^ "Special Operations Troops From 15 Countries Conduct Allied Spirit VI". Department of Defence. 29 March 2017. ^ Joint Chiefs of Staff (17 December 2003). "Joint Publication 3-05: Doctrine for Joint Special Operations" (PDF). Retrieved 27 April 2008. ^ Waller, Douglas C. (1994). "The Commandos: The Inside Story of America's Secret Soldiers". Dell Publishing. ^ "FM 3-05: Army Special Operations Forces" (PDF). U.S. Department of the Army. September 2006. ^ "FM 3-05.102 Army Special Forces Intelligence" (PDF). July 2001. ^ Joint Chiefs of Staff (1993). "Joint Publication 3-05.5: Special Operations Targeting and Mission Planning Procedures" (PDF). Retrieved 13 November 2007. ^ Efran, Shawn (producer), "Army Officer Recalls Hunt For Bin Laden", 60 Minutes, CBS News, 5 October 2008. ^ "Primary Special Forces Missions". goarmy.com. Retrieved 25 September 2018. ^ Maurer, Kevin (4 June 2013). Gentlemen Bastards: On the Ground In Afghanistan With America's Elite Special Forces. New York: Berkely Trade. p. 15. ^ Scarborough, Rowan (23 January 2013). "Africa's Fast-Reaction Force Ready To Go From Colorado". Washington Times. Retrieved 17 May 2014. ^ General Hugh Shelton - Without Hesitation. Hughshelton.com. Retrieved on 2014-05-24. ^ "U.S. Army Special Forces Command (Airborne) History". U S ARMY SPECIAL OPERATIONS COMMAND. Archived from the original on 28 May 2013. Retrieved 2 March 2013. ^ "U.S. Army Special Forces Command (Airborne) History". U.S. ARMY SPECIAL OPERATIONS COMMAND. Archived from the original on 28 May 2013. Retrieved 2 March 2013. ^ "United States Army Special Forces Command". ^ "About". 10th Special Forces Group. Retrieved 26 September 2018. ^ "Structure". Fort Campbell. United States Army. Archived from the original on 22 March 2007. Retrieved 8 March 2007. ^ "Special Forces Operational Detachment Alpha (SFOD A)". ^ "Qualifications". goarmysof.com. Retrieved 2 March 2018. ^ "Special Forces Officer (18A)". goarmy.com. ^ "Special Forces Weapons Sergeant (18B)". goarmy.com. ^ "Special Forces Engineer Sergeant (18C)". goarmy.com. ^ "Special Forces Medical Sergeant (18D)". goarmy.com. ^ "Special Forces Communications Sergeant (18E)". goarmy.com. ^ "Special Forces Assistant Operations and Intelligence Sergeant (18F)". goarmy.com. ^ "Special Forces Candidate Jobs (18X)". goarmy.com. ^ a b "History: Special Forces Green Beret". Special Forces Search Engine. Archived from the original on 10 March 2007. Retrieved 8 March 2007. ^ Simpson III, Robert B.; Rheault (1983). "Inside the Green Berets: The First Thirty Years, a History of the U.S. Army Special Forces". Presidio Press: 31–32. ^ Brown, Jerold E., ed. (2001). "Green Beret". Historical Dictionary of the United States Army (illustrated ed.). Greenwood Publishing Group. p. 220. ISBN 9780313293221. ^ Military staff. "A Short History of the Use of Berets in the U.S. Army". Army Black Beret. Archived from the original on 1 October 2014. Retrieved 30 April 2013. ^ a b c Gamarekian, Barbara (22 November 1988). "Washington Talk: John F. Kennedy, 1917–1963; Hundreds Are in Capital For 25th Remembrance". New York Times. p. 2. ^ "Special Forces - Shooters and thinkers". Retrieved 10 August 2016. ^ "Green Berets vs Navy SEALs - Difference and Comparison | Diffen". Retrieved 25 September 2018. ^ Charles H. Briscoe. "The Special Forces Operator 1959". Veritas: Journal of Army Special Operations History (V14/N1), pp. 63–64. ^ Haney, Eric L. (2002). Inside Delta Force. New York: Delacorte Press. p. 325. ISBN 978-0-385-33603-1. ^ Moore, Robin (2002). The Green Berets. St. Martin's Paperbacks. ISBN 978-0-312-98492-2. ^ "PEN/Hemingway Award for Debut Fiction". PEN New England. Wikimedia Commons has media related to United States Army Special Forces Command (Airborne).